The venue on the second night of the Rotary Club of Lincoln carol singing was Bunkers Hill Care Home. Thanks go to one of the staff, Donna, who acted as both guide and additional carol singer. 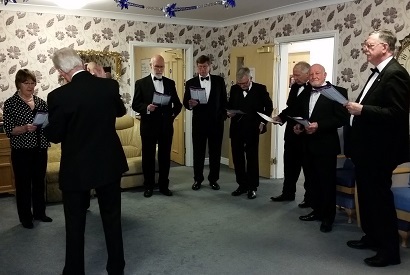 Four separate mini-concerts were performed in each of the units of the home. In addition to applauding the efforts of the volunteer singers, just in case the audience didn´t, thanks goes to Rtn Peter Howard for organising both evenings and conducting the choir. The choir if full voice. Terms & Conditions All site design and content except Rotary devices copyright © Phoenix Creative 2006. All rights reserved.